A beautiful aquarium is a true decoration of any apartment. But if it is not to care or to violate it inept actions biological balance, all beauty disappears. Glass are overgrown, the water may become green from the rapid development of single-celled algae. In this case, to restore the broken balance? The rapid development of algae that cause algal bloom, occurs when the bright aquarium lighting, high temperature and high content in water of nutrients. The cause is often the use of too much dry food – the aquarium inhabitants don't manage to eat it all and, as a consequence, the remains rot and decompose. Faced with the flowering of water, do not try to clean by partial substitution. Adding fresh, you bring in the aquarium and algae need minerals, algal blooms increases. To restore the disturbed biological balance, turn off the aquarium lighting. If he stands near the window, cover the window, protecting the aquarium from direct sunlight. Stop feeding fish – week-long hunger strike will not only hurt them, but on the contrary, will benefit. Aeration may work within the water, oxygen will accelerate the oxidation of decomposition products, animal feed and water purification. Remove from the bottom using the siphon the accumulated garbage. During the week you will be able to recover the normal operation of the aquarium. One of the ways of dealing with algal blooms is the use of Daphnia. Start the aquarium with a large number of shrimp – so much that the fish didn't immediately eat. Unicellular algae are the food source of Daphnia, during the day the water in the aquarium will be clean. This method requires good aeration of the aquarium – otherwise, the Daphnia may die, that will only exacerbate the bloom. The indirect cause of the rapid development of algae is a small number of plants in the aquarium. When plants are many, they actively absorb minerals, as a result, the algae for the rapid development they are not enough. Even in a properly functioning aquarium walls gradually covered with a thin green patina. Clean this plaque scraper with a razor blade. If the plaque is of brown color, it indicates insufficient aquarium lighting. The back wall of the aquarium is not cleaned. Summer is a great time for travel, walking, bathing. As you know, the bathing season begins on the feast of Ivan Kupala Ilyin and ends the day. 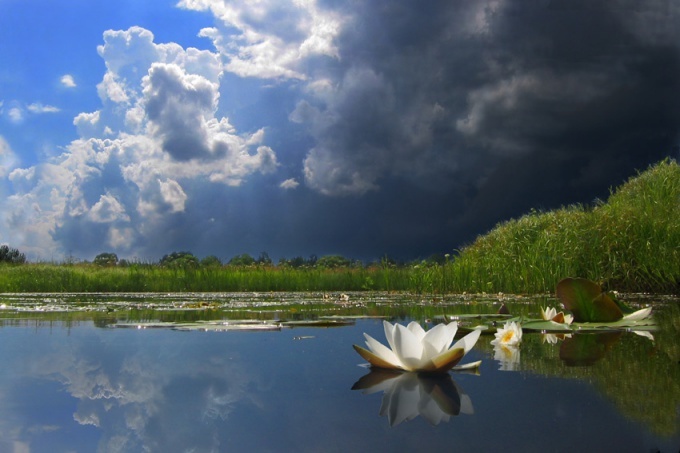 On this day comes the beginning of flowering of water. However, the culprits for the algae algae are. Their concentration in the pond can be overwhelming. Danger to human health such green water is not, however, bathe in it would not want someone of the campers. Meanwhile, the flowering of the river can have a detrimental effect on its inhabitants. It is proved that the overabundance of vegetation and the active development of algae in the river water leading to reduced oxygen levels, which in turn causes the death of large fish and the rotting bodies of water. Small fish are more mobile, and therefore, typically, they migrate up the river, entering the estuary. Of course, the ever-green river can not be. Typically, the activity of the bacteria, and the development of algae is reduced with the arrival of the first autumn rains and decreased water temperature. By September in the middle belt of the Russian river water gets its original color, the lake cleared to the end of the month. "Flowering" of water is characteristic of various reservoirs, including home aquariums. Green water is usually in the summer, in July or August, this process may be accompanied by unpleasant smell and loss of fish. To get rid of the "blooming", it is necessary to understand the cause. Except for fish, snails, plants and other animals in the aquarium and home to plankton, causing algal blooms – filamentous and unicellular green algae. In conditions of medium or low light, low water temperature, phytoplankton multiplies slowly, the water remains transparent. Intense increase in the mass of microorganisms contribute to some factors. The main reason for the enhanced growth of microalgae – a large amount of light. If the aquarium lighting is too intense, water can go green even in winter. During the summer, "blossom" is enough natural daylight, especially if the aquarium is exposed to direct sunlight. The second important factor is "blooming" of water, raising its temperature. Active division of the phytoplankton begins when the water temperature becomes above average. The presence in water of excessive amounts of organic matter is another factor contributing to the proliferation of microorganisms. If you badly need the hygiene of the aquarium and regularly overfeed the fish, in this medium began to share in the phytoplankton, especially of a Euglena green. The last factor affecting the purity of the aquarium – the lack of inflow of clean water. If you skimp on the filter and aeration, suffers from chemical and biological balance of water that leads to the transformation of the aquarium in "the swamp". The most radical way of getting rid of "bloom" - a complete replacement of water with the subsequent shading of the aquarium. If you completely change the water problem, it can change to third and cover the aquarium from light. Without lighting the phytoplankton will cease to reproduce, and ciliates, for which he is feed, clean water. In addition, the aquarium can settle Daphnia, shrimp, catfish, snails, which also feed on microscopic algae. 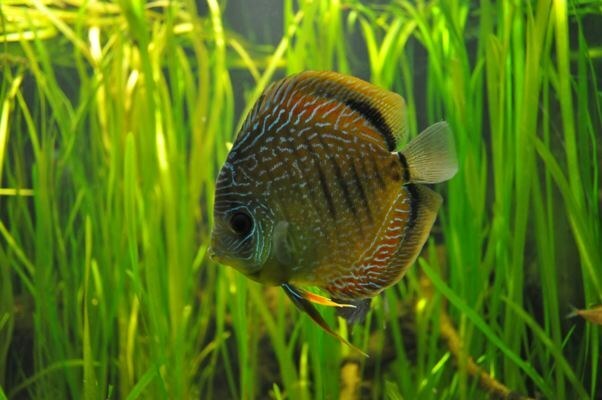 If the water turned green – reduce the amount of feed to the tank inhabitants. Normal fish have to eat all in 5-15 minutes. For a day or two you can even completely stop feeding the fish enough and the food which is already in the water. Watch out also for the correct operation of the devices for filtering and aerating aquarium – this helps to avoid excessive accumulation of organic matter in the water. 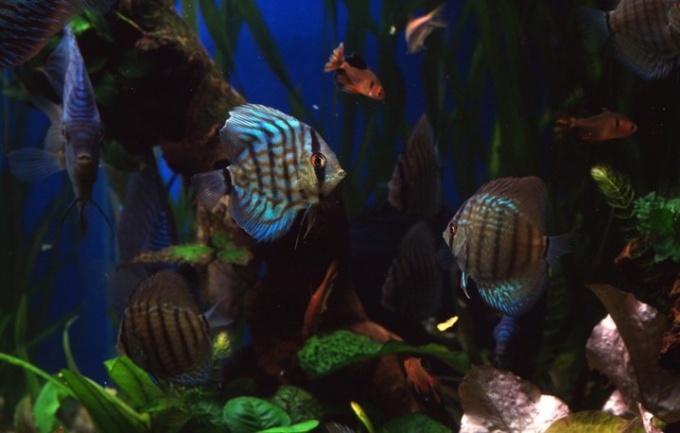 A slight greening of water for fish is not considered dangerous, but if the bloom is strong enough – it could be fatal for some of the inhabitants of the aquarium. Green algae clog gills of fish, and besides, in the dark phytoplankton needs oxygen, resulting in the "official" aquarium inhabitants start to suffocate. If all your efforts do not lead to purification of water, try to use chemicals – you can buy them in pet stores. In compliance with the instructions and the specified doses of these substances are safe for aquarium inhabitants and plants.